A group of Mandari youths at a cattle camp, sitting on a large dead tree trunk with tethering ropes slung over it. One of the youths is holding a puppy, and a goat kid is visible in the foreground. The nearest youth is wearing a fibre neck ornament. Morton, Chris. 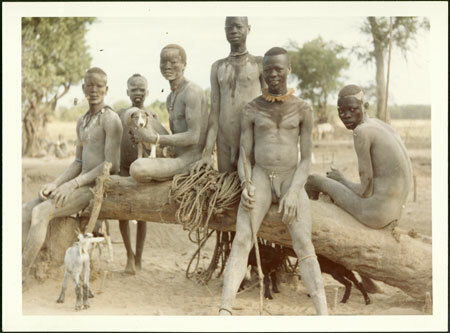 "Mandari youths at cattle camp" Southern Sudan Project (in development). 03 Jan. 2006. Pitt Rivers Museum. <http://southernsudan.prm.ox.ac.uk/details/1998.97.349.2/>.